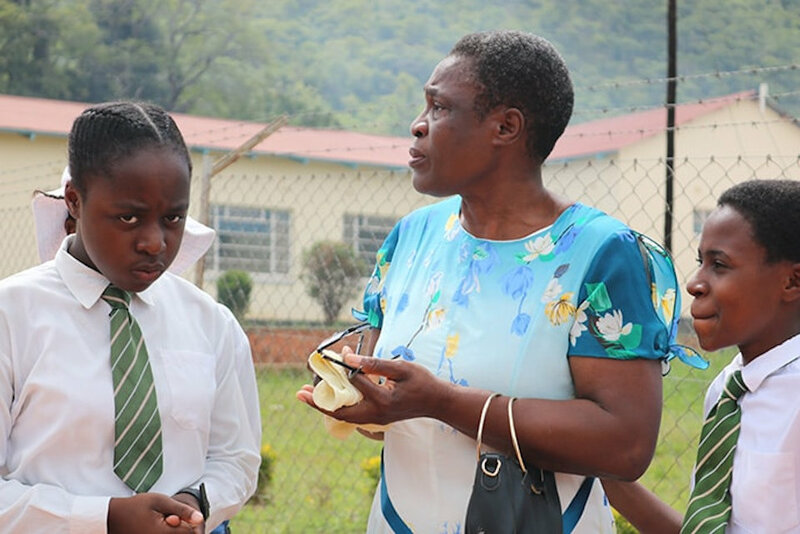 Fire destroyed the junior block at Hartzell High School, a United Methodist school at Old Mutare Mission, leaving hundreds of students with no classrooms. 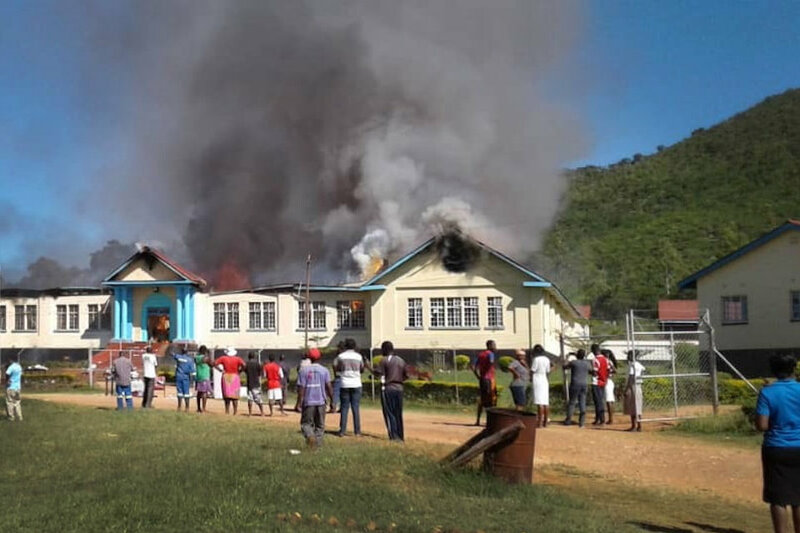 Fire has destroyed the junior block at Hartzell High School, a United Methodist school at Old Mutare Mission, leaving hundreds of students with no classrooms. No one was injured in the April 6 blaze at the school, which is situated close to Africa University. The gutted block housed eight classrooms, two specialist rooms — for Textile Technology and Design and Food Technology and Design programs — the deputy headmaster’s office and the storage room that housed all of the school’s textbooks. Hartzell headmaster Shorwi Kawadza said the deputy headmaster called him shortly after 8:30 in the morning. “Some schoolchildren reported that they had seen smoke coming from the basement of the junior block and we went to investigate. “We called the fire brigade (based in Mutare, about 16 kilometers away) and tried to put out the fire using hoses, but it was too strong,” he said. The Rev. Joseph Chimberengwa, mission station chairperson, said police are investigating the cause of the fire. “The cause of fire is not yet clear, but it is suspected to have started from the basement of the building as a result of an electrical fault,” he said. Godwin Mupuro, deputy headmaster, said he has not yet come to terms with the reality. Kawadza said 75 percent of the textbooks in the book room were destroyed. “We do not know how we will replace them,” he said. The Rev. Munyaradzi Timire, Zimbabwe East Conference education secretary, noted in his report that the Textile Technology and Design department sewing machines and Ordinary Level coursework projects had been burned. “The school is calm (but) students are worried by the loss,” Timire said. Edina Ngwenya, Textile Technology and Design teacher, said she collapsed upon seeing the flames. “I did not believe what I was seeing,” she said with tears running down her cheeks. Textile Technology and Design had 26 hand-operated sewing machines, five computerized and two electric machines. Food Technology and Design had four electric stoves and two gas stoves, one upright fridge and a deep freezer. The school is still in the process of recording items lost and accessing the total damages. “The students had positive attitude towards the subject and had worked with great determination to complete the coursework projects,” said Ngwenya. Old Mutare Mission is also the site of Fairfield Children’s Home, a project supported by Michigan United Methodists. The Baby Fold there is an Advance Special project found in Engage MI. She said it will be hard to motivate students to start over and complete the task before the due date. “It is really hurting that we have lost our projects, which were we were bound to finish. Our teacher encouraged us to work hard and put more effort and that’s what we did. I can’t explain how I am feeling because of the incident,” said Fadzai Sagori, another fourth-year student in the program. The incident happened five days before schools were set to close for vacation break for about four weeks. Administrators are seeking clearance from the ministry of primary and secondary education to have early closure for first- and second-year high school students whose classes were destroyed. The block, which was built in 1949, housed classrooms for about 270 students. “This was not an ordinary building,” said Kawadza, who has been head of the school for seven years. “It was a massive and unique structure with basements so we will need to engage engineers when we begin reconstruction. I do not think we can complete the building before schools open in May, even if we get the funding for reconstruction,” he said. The school head said the major challenges facing the school following the fire include where to house the students this week, where to conduct lessons next term and how to replace the textbooks destroyed. “We would want to maintain the original setup because the infrastructure was very historical,” said Chimberengwa. He and Kawadza estimate that the junior block will require about $500,000 U.S. to rebuild. Old Mutare Mission is across the road from Africa University and officials at the United Methodist-related institution expressed concern over the incident. The building has a cross that interfaces with the one at Africa University. Neither the cross nor a Bible found in the ruins were damaged in the fire. 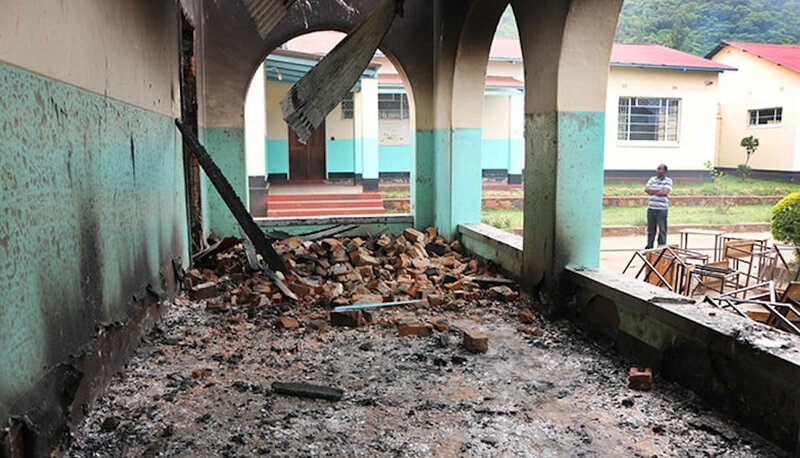 “The Bible was taken down unburned and given to the headmaster,” Chimberengwa said. Zimbabwe Episcopal Area Bishop Eben K. Nhiwatiwa said he was thankful the staff and students were safe. “We were very concerned, but we thank God that there were no injuries or loss of life, and the building will be renovated as we go on,” Nhiwatiwa said. “We don’t lose hope. The church is always there to focus on the lives of people and provide help,” the bishop said.